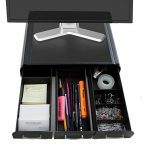 I am always looking for unique cubicle storage options since there simply isn’t a lot of space in my small working space. 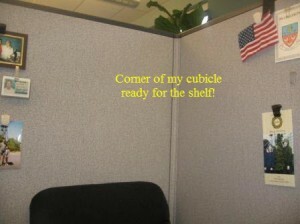 As a member of Cubicle Nation, I try as best I can to make the best of my work situation. I’m very happy to be employed so I try not to complain about wanting a more spacious office. 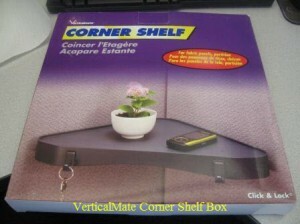 So, trying to add some strategic cubicle accessories that work for my office is certainly one of my highest priorities. I found this hanging corner shelf unit made by VerticalMate online and had to have it. I immediately liked the way it could be hung in a corner which basically took no space away from me and added some much-needed storage. 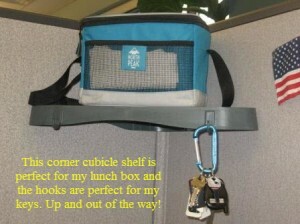 I had a specific purpose for my corner wall shelf and it was to hold my lunch box (see images below). My lunch box has a strap that I used to hang from a cubicle clip on the wall of my cubicle. The only problem was that the lunch container was so heavy when it was full, it was causing a rip in the fabric of my cubicle wall. 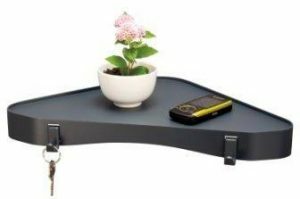 When I saw this small wall shelf with hooks, I knew I could not only place my lunch box on it, but I could also hang my keys from one of the hooks. What is so great about it is that it is a floating wall shelf so there are no hangers that are visible which gives it a really clean and classy look. I actually found this shelf after I wrote this article which speaks to the many different varieties of office shelves that are available. 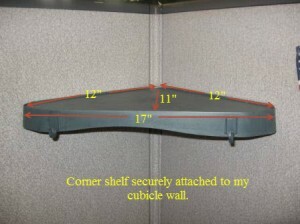 Well, you can add this floating corner shelf to the large list! 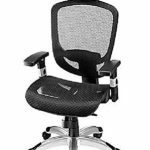 One thing about this particular shelf versus the cubicle shelf in this article is that the stainless steel needles or pins that are used in the cubicle shelf are attached to the side of the shelf with an adhesive backing. 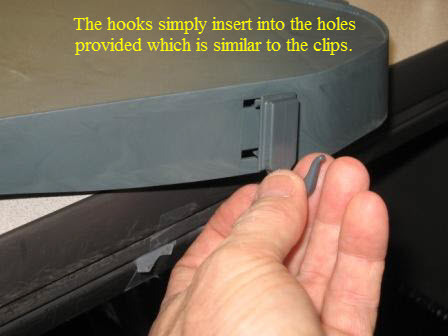 With this floating wall shelf with hooks, the clips with the needles that sink into the wall fabric are inserted into keyhole-like openings in the sides of the shelf and hold solid without any adhesive backing. 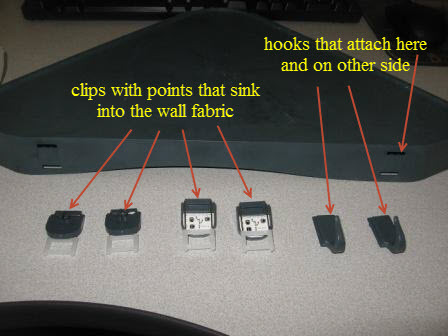 Both methods work fine since I've had my cubicle shelf for almost a year now and it has been solid as a rock on my cubicle wall. Floating wall shelf with no cumbersome wall hangers. This unique hanging corner shelf unit took me roughly 5 minutes to put together and to hang. There is basically nothing to it. This floating wall shelf with hooks is a great addition to my office and it takes up no additional room whatsoever. So, if you are looking for a small corner shelf for your office cubicle, the Officemate Verticalmate Corner Shelf Unit might be the one for you. It has worked well for me! Another great cubicle accessory for your cubicle wall is a Fellowes Coat Hook and Clip. It gives you a great accessory for hanging your coat and gloves. 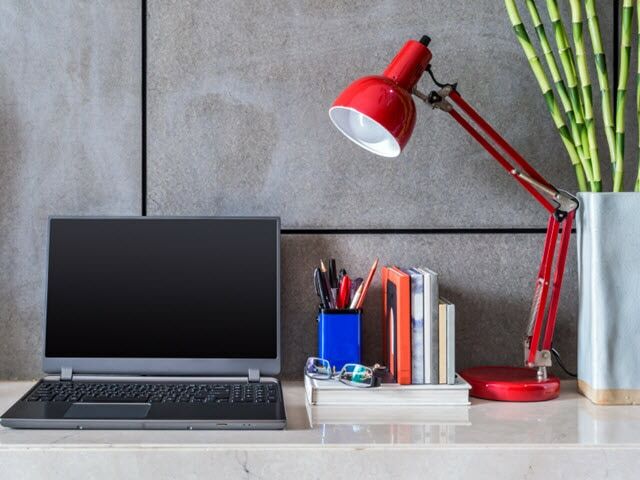 Also, if you really want to explore how you can make your office more like your home you will love reading this article. Once again, if you have any questions whatsoever, just leave them in the comments or use my Contact Me page. Will the shelf hold a 5 lb plant? Does it come in different colors? Thanks for the question. 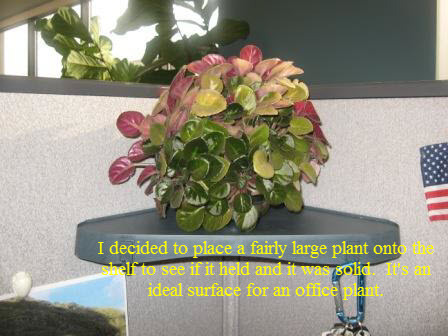 In the article I actually show a picture with a plant on the shelf. I would say that pot and plant was about 5 lbs. I wouldn’t try to go any heavier though but I think at 5 lbs you should be safe! Just make sure you affix the shelf to the cubicle wall properly with all of the needles into the fabric walls. Howdy! I have this exact one, but I’m having problems getting it to go into the cubicle wall. Either the pins don’t catch the fabric, or one side catches too far out. Any advice? I think it’s just a matter of adjusting the needles. Maybe asking a coworker for a hand when you are sinking the needles into the wall would help. You need the same amount of pressure sinking the needles on both sides at the same time. TBD, it really doesn’t have to be in there perfectly. 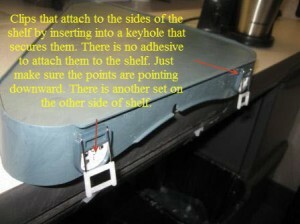 Mine isn’t in there perfectly either but it does the trick and I haven’t had any problems with storing items on it. It’s not recommended for heavy items but it’s great for items like safety wipes, compressed gas canisters, or even a small plant. My suggestion is to ask a coworker and just adjust the needles at the proper angle and you should be OK.